Intertex Textiles supplies head to toe safety clothing for protection from radiant heat and molten metal. All of our face shields are made from scratch resistant and strong polycarbonate material. 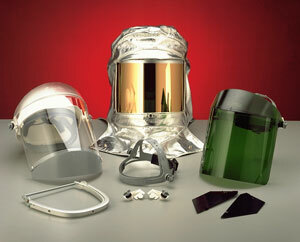 Intertex is a supplier in Canada of heat reflective gold face shields. Our protective gold face shields reflect radiant heat, as well as harmful UV & IR light away from a worker’s eyes, to not only protect but also to keep their face cool. As a supplier of gold face shields in Canada, Intertex also offers clear polycarbonate face shields, green tinted & blue Didymium gold face shields, as well as safety glasses, hard hats, and other heat resistant face protection. Intertex is a Canadian safety glasses supplier. Our safety glasses are made out of scratch resistant polycarbonate and are designed to last, protect, and be affordable. Intertex is a Kevlar™ gloves manufacturer. Our Kevlar™ gloves and mitts are designed to block heat, and to stand up to demanding applications where extra durability is required. Our Kevlar gloves are typically used in foundries and metal casting operations. Intertex Kevlar™ gloves are excellent to protect worker’s hands when picking up hot die castings and metal ingots. Our Kevlar™ double palm insulated Ingot Mitts are some of the most heat resistant Kevlar™ gloves in the industry. As well as Kevlar™, Intertex also manufactures heat resistant Thermoglass™ mitts and gloves. Our Thermoglass™ mitts are an excellent high heat alternative to Kevlar™ where abrasion is not as great a concern. Thermoglass™ fiberglass mitts have become a standard in heat resistant foundry and molten metal safety clothing protection.